Rodvik, you are always good for a laugh!! the talk on every group chat I follow is how lag has gotten worse over the last few weeks! My experience is the same and as best I can trace the cause it goes to the LL network or the sim servers. I do not mean to suggest that you are not trying. More toys all the time on the servers, display names, 42 groups ---- lag increases with time. When the servers finally break someone is for sure to blame the one really useful thing to come along in some time, Megaprims. the talk on every group chat I follow is how lag has gotten worse over the last few weeks! That's exactly what he meant when he wrote about improving lag. If you improve productivity, for example, you do the exact opposite of reducing it. The same applies here. The new and improved lag is laggier than ever before. There's really only so much LL can do with lag. The problem is that SL went about 8-9 years with no way of checking how much sim resources scripts were taking up, now we have a population used to being able to wear the laggiest things they can get their hands on and blaming the lag on some vague "other" that the Lindens need to fix. Meanwhile they continue to run around with 60MB of script memory, they continue to create no-mod attachments filled with laggy re-size/re-texture/re-colour scripts, and complain about the lag like they've nothing to do with it. Not to mention the use of bandidth sucking bots instead of proper NPC objects, people running around with their bandwidth set as high as possible, people filling sims with bots to drum up traffic at the expense of not only the sim they occupy, but every other sim on that server. LL's biggest fault is that they took so long to provide us proper tools to see how we affect lag ourselves. They've still yet to impose any kind of limits on how much sim memory a single avatar can eat up. 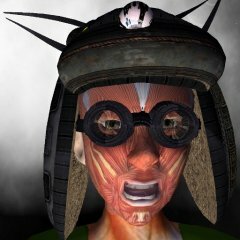 Yes, LL needs to do a lot of work in reducing the lag problem but we also need to take a look at our own products and avatars and figure out if we're a part of the problem. I'm going to take issue with you over this. 1) Linden Labs were responsible for the introduction of the worst memory hogging scripting language known to Geekind. Not us, Linden Lab. 2) Yes Resize/recolour scripts in Hair and shoes have been taken to insane levels by inept creators...but they did know what they were doing, some were just lazy. 3) Some users are just too bone-idle to remove or kill scripts in such objects. 4) Avatar script-limits was just a smoke-screen put up by the Lab to try to ameliorate a bad situation which was largely their own creation. Yes, a lot of sim-lag is due to idiotic, or ignorant users who do not realise what effect their 250-prim, 250-script hair does to a server; but the root cause of this was a laissez-faire attitude among the Guardians of this medium. Maybe a campaign of education of new, and not-so-new residents would be the place to start. Thanks Penny for making some sense. Well, that reply actually made a lot of sense. It's something we should really mention to both old and new users. Honsetly, it's not my fault. No really, it's not my fault! Come on guys, why won't you believe be when I say it's not my fault? See, it's LL's fault for believing in me! Yeah right. That would be just like LL saying it was my fault.